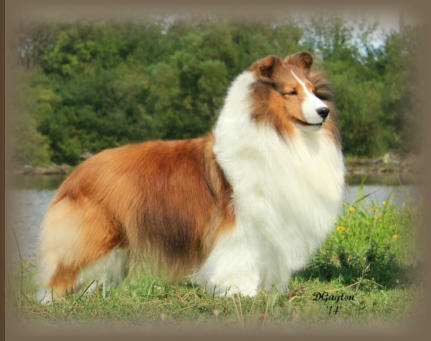 Honey is bred and co-owned with good friend, Esther Hall, Coastwynn Shelties. This beautiful young lady has exceptional grace and movement; she has passed these qualities on to her champion kids; Multi BPIS, BPISS, Ch. Westpointe’s Guilty Pleasure “Sindee”, BPIG Ch. CoastwynnCounterpoint, “Sam”, BPIG Ch. Westpointe’sAffinity “Kenzie”. Honey finished her US Championship in style with a 4 and 2 - 5 point specialty majors. Honey was awarded an Award of Merit at the 2014. Canadian National by respected Judge, Tom Cohen.